We all like a good movie and fadm bixby announced yesterday that we would be having a movie night to complete Aeon's 5th anniversary celebrations. A few of us made our way to the Roddenberry centre in galaxy which is the usual location for the General Meeting but which had been transformed into a cinema for the night. 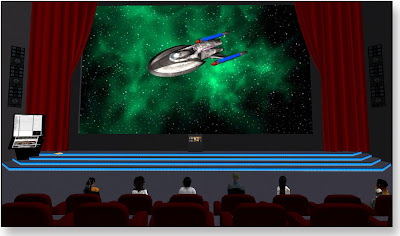 Playing at this rezzed theater was a fan made star trek youtube six parter called "star trek:Amanda - the movie" an enjoyable home made computer generated trek story. We all seemed to enjoy the mini movie and lets hope we could do something like this more often. If you want to see what you missed check the links out below.